You’re walking in a different country, with different lifestyle and culture. Everything changes: language, history, street names, daily habits. Learn to forget your usual way of living at home and look at things with new eyes and open mind. Try to capture and experience the essence of places that you’re visiting. Don’t expect the US; expect and appreciate the differences and embrace them. It’s hardly possible to visit Rome in a month, so don’t think you can see it all in 3 days. Choose some spots and learn to sit down and taste the atmosphere. Drinking a glass of wine or water in a square reveals more about Italy than visiting all the churches or museums. Make your travel enjoyable, not necessarily tiring. It’s more than simply downtown. It’s the heart of a city and the oldest part of it. In many cases, Italians call the main square the ‘salotto buono’, the nice sitting room. 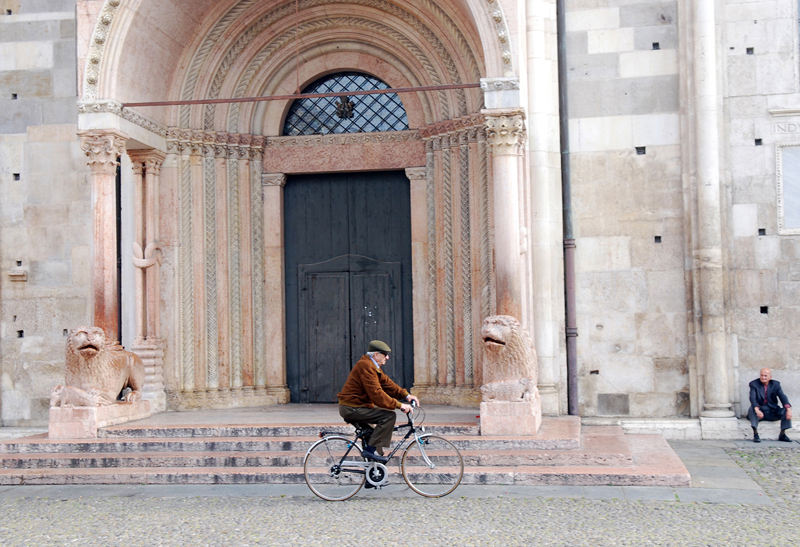 Explore the best piazze in towns. And remember: in Venice there is only one (Piazza San Marco), all the others are named ‘Campo’. Piazza San Pietro is in Vatican City, Piazza Navona is more like the sitting room of Rome. Lucca, Trieste, Verona, Genova, Padova: every town has its own salotto. Don’t be surprise if people speak Italian. It’s their language! Spanish is spoken in Spain, so don’t be upset if your best try isn’t understood in Italy. Well, some words could help, but a smile is always the best international language. Expect the menu to be in Italian and maybe English. Ask for the menu both languages. Sometimes the Italian is not translated well and you will recognize more of the Italian names. To learn about a country, food is probably the fastest way. Italian cuisine is one of most appreciated in the world, and of course the pizza in Italy won’t be the same as in Chicago or in New York. You’re close to the “truth” of many tastes: tomatoes, pasta, mozzarella, coffee… Try to follow the locals, avoid places with too many foreign languages. Don’t be afraid of asking recommendations and trust your instinct! Remember each region has their specialties—have pizza in Rome or the Naples area; have seafood in Venice. Who’s writing lives in Italy and drinks cappuccino whenever he wants. There is no hour restrictions. Get rid of clichés about Italy. You can order cappuccino in your favorite pastry shop at any time. They will serve it! Of course, learn the right ways of ordering your coffee (Starbucks misleads your knowledge): ristretto (short), lungo (with more water), americano, macchiato (with milk—cold or warm), macchiatone (larger than macchiato and smaller than cappuccino), corretto (with a drop of liquor), latte macchiato (a cup of milk with a shot of espresso). The best corners in town are discovered when you lose your way. It’s Murphy’s law, especially when you’re walking, in Venice, Florence or in smaller cities like Lucca or Siena. You have a chance to catch ordinary moments or scenes of real life. You will experience something that belongs only to you. It is not a sin to get lost. It’s the most informal way of greeting. Italians normally say ‘ciao’ to relatives or friends. With elderly or unknown persons, it’s more appropriate to say ‘buongiorno’ or ‘buonasera’, according to the different moments of the day. ‘Arrivederci’ (Goodbye) is used to take leave. Then ‘Buonanotte’ is at the end of the day. When you travel in Italy, a good book tells you more about the country than any other tour guide. Your experience of a place is captured by all your five senses. Novelists are able to express and give shape to your feelings in a proper way. Try to explore a little downtown and look around the street, rather than stepping in the first shop. Learn to be curious. But, but don’t wait for the next city or town. Whatever you are looking at will not be there. If you like it, get it or you won’t.